Favela Experience - Favela Tour: Exploitation or Life changing? At the end of the Favela tour we stood in a narrow dark alley way- it had started raining and behind us loomed a UPP officer (Police Pacification Units) in the shadows. A group of little boys around 8 or 9 years old were running up and down kicking a ball and yelling. One of them rushed the group laughing, and my initial instinct was to clutch my bag. After watching City of God and being overly inundated with youtube videos, warnings from friends, and strong subconscious racism towards black men from growing up in white America, I saw this little boy as a threat. WTF. “Your home, this place”, Erik explained. The boy reached into his pocket and pulled out a small candy. As Eric tried to gently have him step aside, he again persisted, this time spinning in a circle - Eenie Meenie Minie Moe (in Portuguese). He landed on Carolina and with a big grin handed over the candy. He then proceeded to pull out 5 more and give one carefully to each woman in the group. My heart sank. How did I manage to crucify this child before he had a chance. This is a Favela tour at its best. It will blow your mind and make you think differently. Our tour was organized by Favela Experience, given by Eric who grew up in Rocinha and pays 300R$ for rent / month. This tour just paid his rent. We also spent 5R$ on mototaxi rides, 6R$ on Açaí and 5R$ to the local family who opened the doors to their home for fresh juice, dancing and an incredible sunset view, all supporting the local economy. I felt pretty good about myself when I took the internship at the Favela Experience. I was going to live in a place where I was (am) the minority, learn a new language, bring my own income into the economy, and then share this experience with others. But there is a lingering feeling of cultural exploitation. By snapping photos of the endless staircases and electrical cord chaos, knowing I’ll be back in suburbia America in 60 days, is my “Favela Experience” Disneylandification? When I got here I was on track with my objectives, I enrolled in Portuguese classes and bought a membership (85R$/month) at the local Vidigal Academia (gym). Then I met Guto, a local urban designer. He did not mind that my Portuguese is subpar (to say the least). He came into the Favela Experience office when I was working and took an hour out of his schedule to educate me about the place where I now call home. Guto is jet black with dreads pulled back into a ponytail, kind face and slow gentle speech. His Portuguese was mellow and for the most part not difficult to follow. He explained to me the history and more recent gentrification of the Vidigal favela. There were years when Vidigal was not a safe place. The drug trafficking gangs were more forceful than the police. In 2011 Vidigal, and neighboring Rocinha Favela were pacified. This meant they were “invaded” by UPP (Police Pacification Units) to combat the gangs and “pirating”. This process was done with intention and ample warning to avoid shoot outs. 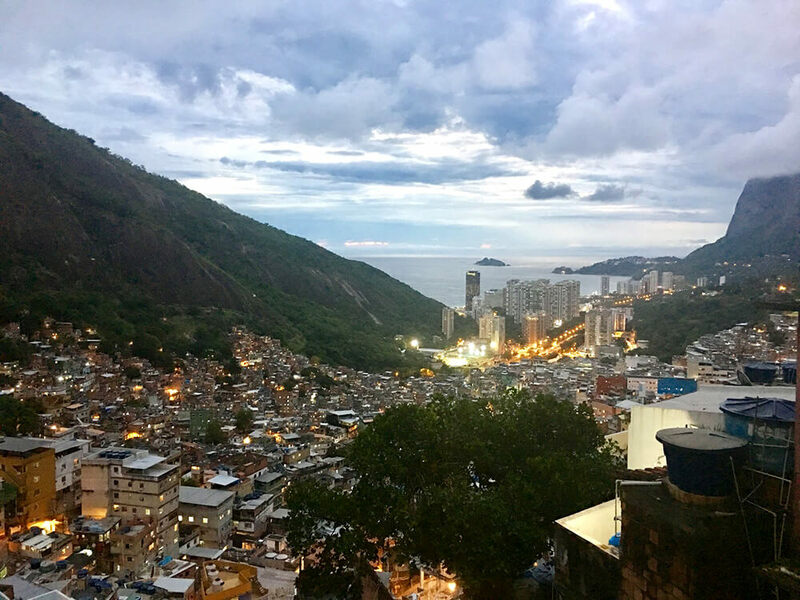 Rocinha and Vidigal Favela provide the connection between South Zone (Ipanema and Copacabana Beaches) and São Conrado, Barra and Recreio, so avoiding conflict was in the best interest for involved parties. If drug lords wanted to escape, they had months of warning and news coverage before police units set up posts around the Favela neighborhoods. Today in Rocinha and Vidigal the UPP have primary units at the base of the hills. When thinking about the Favelas it is helpful to reverse American Logic of wealth and desireable property. In Rio the real estate prices jump on flat land- that’s where the nice beaches are, transportation and services. This is where amidst the sugar plantation and coffee booms the wealthy set up shop, and has since been developed into touristy beaches and sky rises. The areas away from basic services and harder to reach on foot (“Morros” or hills) are where the Favelas sprawl. In the late 19th century following the end of slavery Latin American Capitals saw a boom of population growth as metropolitan living became more desireable. The poor immigrants did not have money for housing so they got creative in the construction of their hillside homes. The term “Favela” is based on a tree that grows in the hills. The Vidigal and Rocinha Favelas are more toward the South of the City and both have beautiful beaches in which one can feel more comfortable leaving your belongings than at Copacabana and Ipanema. This is because after pacification there is a truce within the Favelas to respect and trust each other. This feeling is visceral. As a white, blonde tall woman I stick out like a sore thumb, but I have never felt objectified or in danger while walking around, day or night. Quite the opposite. So when Guto explained how the pacification also brought in more tourists and more appeal which in turn has made things more expensive in Vidigal, I began to squirm. Should I really feel good about myself living and working in this neighborhood? Living in the Favela and working for the Favela Experience has pushed me in ways that I didn’t know possible. When Adam, my boss at the FavEx, brought me to the opening of a Community Center in Providencia, an “unpacified” Favela in Rio Downtown, I had the opportunity to witness what our Rocinha tour guide described as the balance of Favela living- everything that is good is bad and vice versa. 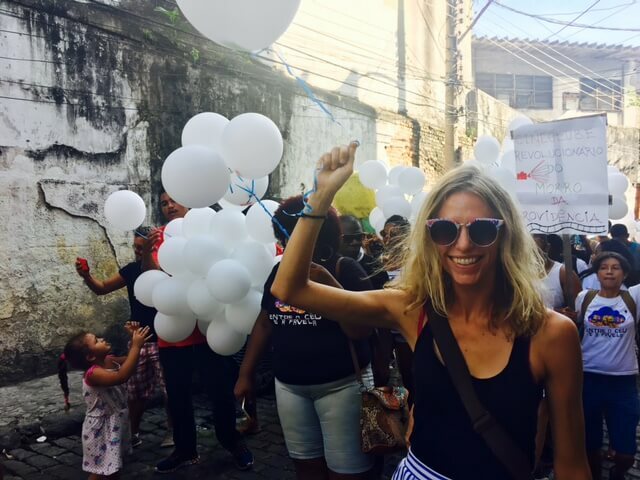 Here in Providencia, the community leaders passion for bring art, music, and theater, motivated the opening of this center, opportunities for youth and inspired our parade through the streets beating drums and handing out balloons and schedules. Equally, in order to do our parade, the community center organizers had to meet with the local drug traffickers prior and arrange for our safety. I got to see the faces on children light up when handed a white balloon, then I’d turn a corner and see a kid and his multiple siblings playing in filth as the teenager in the bushes clutched his rifle and walkie talkie. I have learned far more about community building and living simply in three weeks here, than in three years at the University of Oregon and five years working in public policy non profit organizations. I can easily drop any white saviorism complex I might hold when remembering that. This is Favela Experience and these leaders are my teachers. - Emily Farthing is an American from Oregon, a Senior at the University of Oregon studying Religious Studies, and minoring in Public Policy Planning and Management. and has a great deal of passion for creating positive social change in the world. She is currently partaking in an internship at Favela Experience for the next two months.